You may be experiencing symptoms of thyroid imbalance. And I have the perfect guide to help you: 3 Steps to Heal Your Thyroid. I can tell you that I know how it feels. Once upon a time, I was exhausted, stressed, depressed, and on top of that, my hair started falling out. I found out that I was hypothyroid and set out on the quest to heal and rebalance my hormones. You may not give too much thought to that tiny little butterfly-shaped gland in your neck until you can’t lose weight and your hair falls out (speaking from experience here). But your thyroid is the powerhouse of your body. Thyroid hormones regulate other hormones including insulin, cortisol, estrogen, progesterone, and testosterone. That’s why healthy thyroid function is so important to overall health and balance. If your thyroid is underfunctioning, many other body systems suffer. It’s estimated that as many as 25 million Americans have a thyroid disorder, and over half are unaware. Thyroid disorders affect women far more often than men. Hypothyroid is linked to infertility, heart disease, high LDL cholesterol, depression, and risk of birth defects if untreated during pregnancy. A woman I’ve been working with, let’s call her Natalie, just hadn’t been feeling herself. And, well, she’d been feeling fat, fatigued, and frazzled, she said. I asked if she’d had labwork done lately, and she said yes, that her doctor said everything was normal. Alarm bells went off for me. You see, I work with so many women who, like Kim, say those exact same words to me: My doctor said may labs were normal, but I still don’t feel right. They don’t feel like themselves. They’re frustrated that their doctors are only looking at a piece of paper and not listening to them. So I always look at my clients’ labs, even if they’ve been deemed “normal.” I look at the thyroid panel specifically, and 9 times out of 10 something is out of whack. Not quite out of range enough to be flagged as abnormal, but way off of what we consider optimal. Bingo. And there is the problem. Their thyroid levels are outside the optimal range, and that’s why they’re not feeling great. Their doctor doesn’t see the issue because it’s not outside the lab range. So I got Natalie started on a thyroid support protocol, and she’s feeling a lot better. More like herself. Now I want to share with you all the information I share with my clients to help them heal their thyroids and overcome hypothyroidism. That’s why I wrote this little ebook, 3 Steps to Heal Your Thyroid. 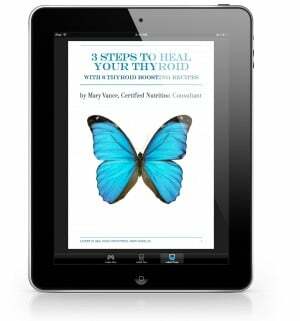 This e-book goes in depth about addressing hypothyroid.